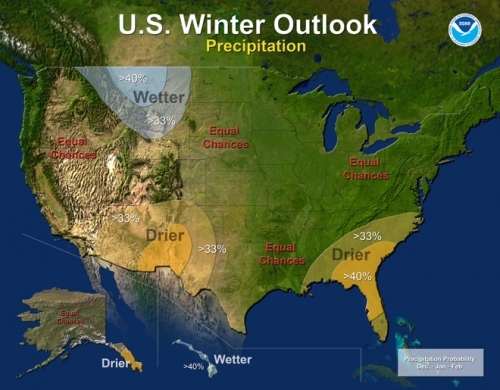 Drought, and not widespread snowstorms, may be the biggest story this winter according to the official U.S. winter outlook. 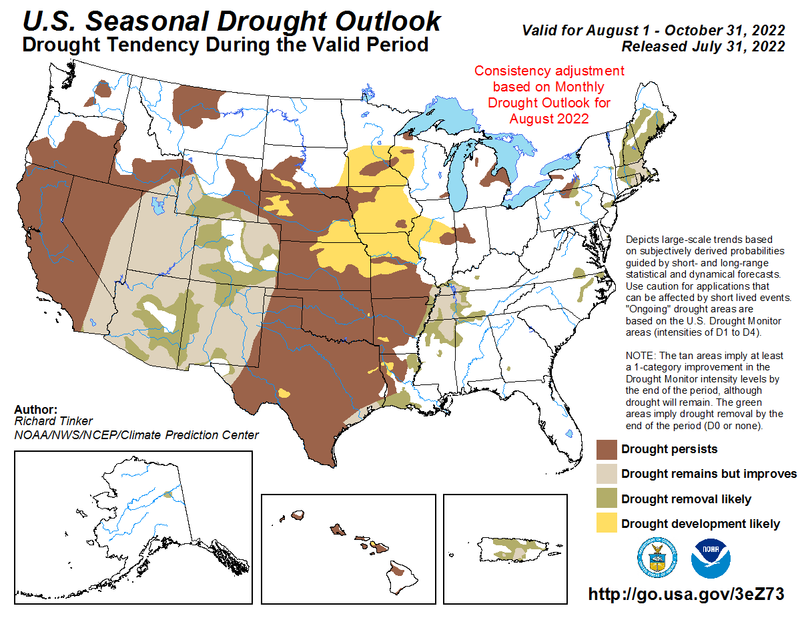 The outlook, issued by the National Oceanic and Atmospheric Administration (NOAA) on Thursday, shows that the winter of 2013-14 is likely to feature an expansion and intensification of drought conditions across the Southwest and Southeast. That includes California, which has had its driest year on record so far in 2013, and which needs sufficient mountain snowfall this winter to prevent water supply shortages during the summer months. 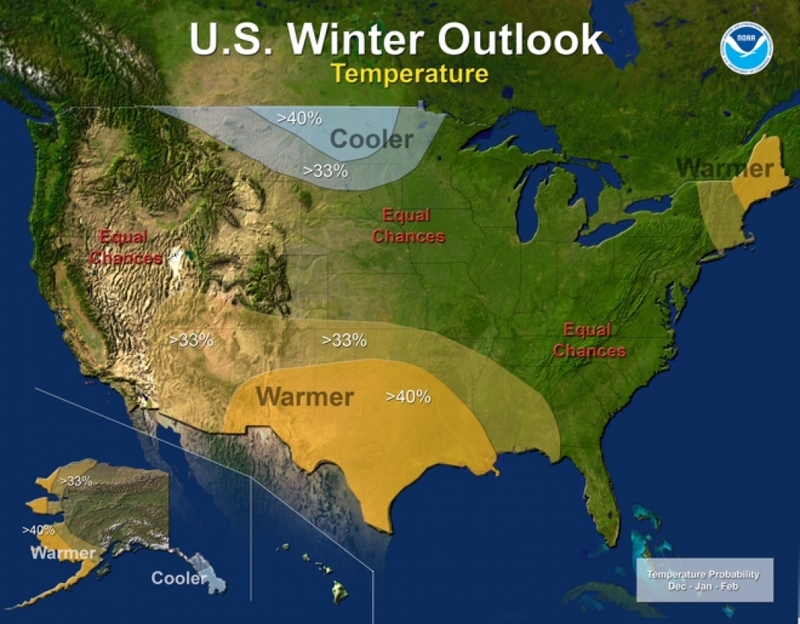 Temperature outlook for the winter of 2013-14. As was the case last winter, the lack of an El Niño or La Niña event in the tropical Pacific Ocean has introduced more uncertainty into the forecast, since those events typically influence temperature and precipitation patterns across the U.S.
“Despite recent advancements, this year’s outlook has again proven to be quite challenging,” said Mike Halpert, the acting director of NOAA’s Climate Prediction Center in Maryland. 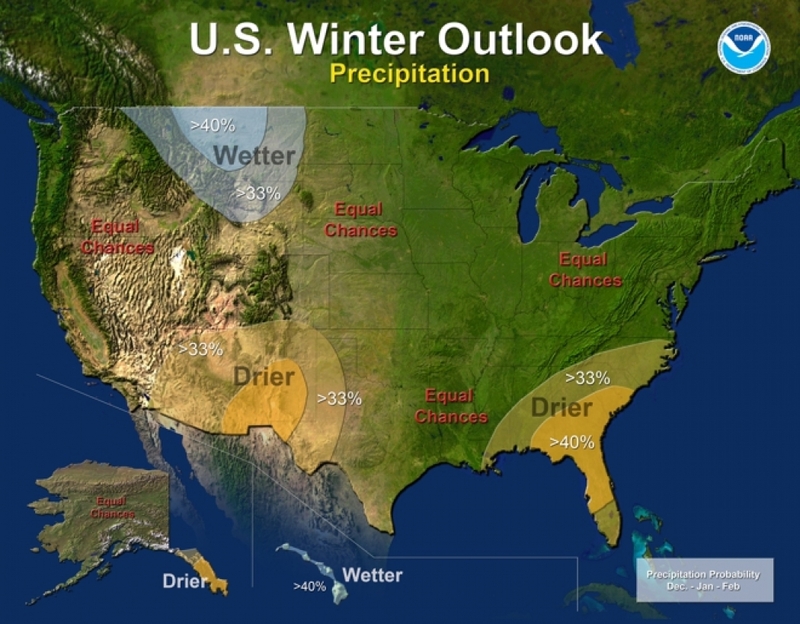 Precipitation outlook for the winter of 2013-14. The rest of the country, though, falls into the “equal chances” category for precipitation and temperature, which means that there are equal probabilities for above-average, average, or below-average temperatures. This isn’t the same thing as projecting an “average” winter, but rather an indication that there was not enough evidence to tilt the odds in favor of a particular outcome. “Our methods indicate a higher probability that cold might linger into mid-December, but then all bets are off after that,” said Stephen Bennett, the president and founder of EarthRisk Technologies in San Diego, which forecasts the likelihood of extreme weather events up to a month in advance. In making its winter outlook, there is some information that NOAA did not take into account that could potentially improve its forecast accuracy and reduce the area of “equal chances” on the map. In addition to El Niño and La Niña, a weather pattern known as the Arctic Oscillation, or AO, also influences winter weather in the eastern U.S. When the AO is in a “negative” phase, cold air more readily spills out of the Arctic and into the eastern states. 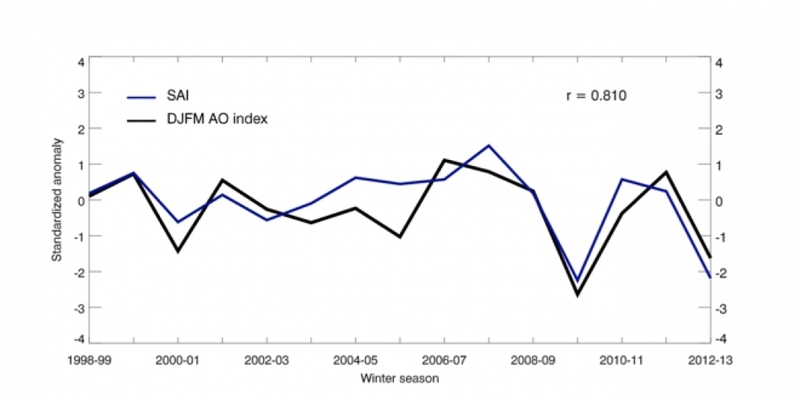 Most of the Mid-Atlantic and Northeast’s snowiest winters have taken place when the AO was negative. 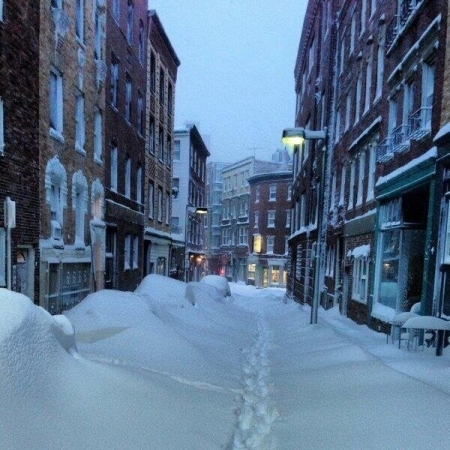 Boston's North End neighborhood amid the snow drifts after a historic blizzard struck in February 2013.
Credit: Twitter via Matt Meister. AER’s Judah Cohen and several colleagues developed an index based on the extent and rate of increase in October snow cover in Siberia. 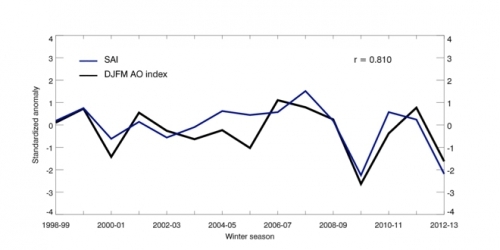 That index has shown a promising link to the wintertime AO through a complex series of interactions with the upper atmosphere, particularly the polar vortex, which is a corridor of fast-moving high altitude winds that forms a ring around the frigid Arctic region. Such mixed signals complicated his seasonal forecast, which Cohen has already distributed to clients in the energy sector and other weather-dependent industries. His forecast, like NOAA’s, calls for the likelihood of a milder-than-average winter in the Mid-Atlantic and Northeast. The correlation between an index capturing the rate of expansion in Siberian Fall snow cover and the phase of the Arctic Oscillation. Click image to enlarge. Credit: Judah Cohen. “It looks like the (Northern) Hemisphere wants to go into a positive AO mode, and that would favor warm temps in the Eastern U.S.,” Cohen said, noting the forecast is far from a slam dunk. “The seasonal forecast business is good for humbling (you) and for making you realize what you don’t know,” Cohen said. NOAA has been reluctant to implement Cohen's methods as a way of improving its winter forecasts, choosing instead to continue to rely almost solely on the tropical Pacific conditions as a forecast basis. That leads to problems during years like this one when there is no El Nino or La Nina present or forecast to develop. 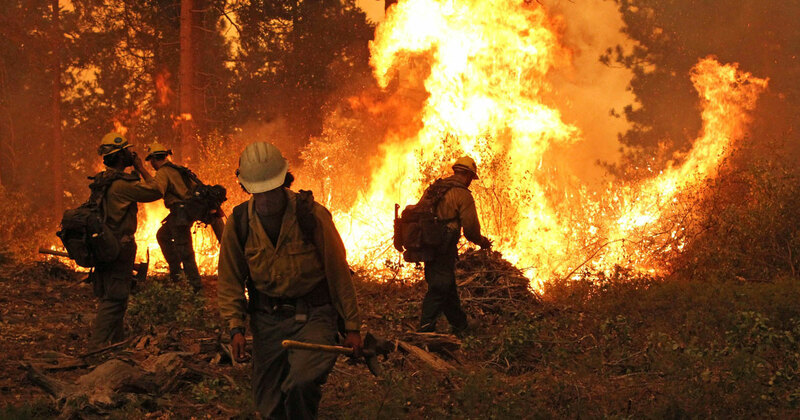 “I certainly think they have been slow — whether it’s justified or not I can’t speak to — in bringing aboard some of the new ideas in the scientific research community,” Cohen said of the Climate Prediction Center. 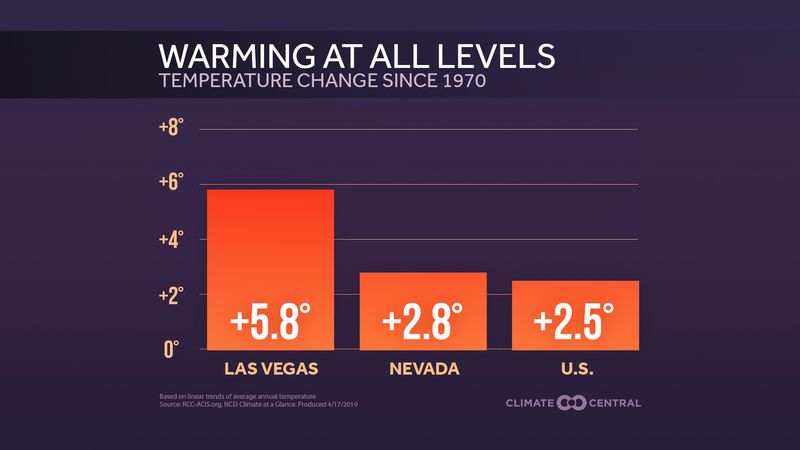 “No tool is perfect, but there is information there that they’re leaving on the table by just focusing on ENSO,” he said, using the acronym for the larger climate cycle that El Niño and La Niña are a part of, known as the El-Niño-Southern-Oscillation. NOAA’s Halpert told reporters on Thursday that NOAA is still researching the potential usefulness of Cohen’s methods. 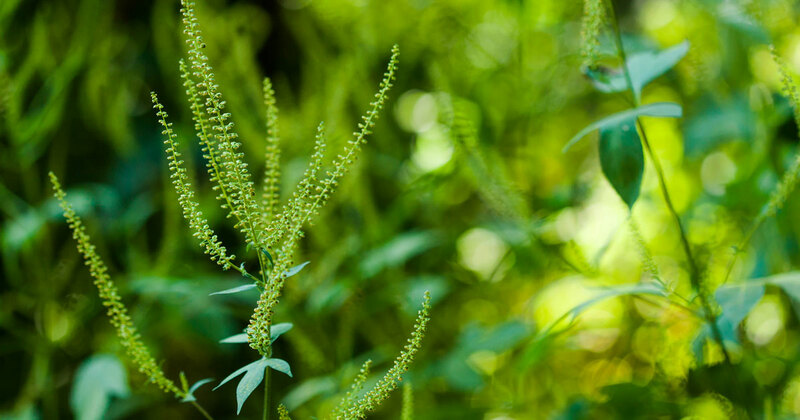 “It is something that we’re still looking at in a research mode. It does look like there is potentially some predictability in the AO,” he said, noting that the forecast issued on Thursday did not include the Siberian snowfall index that Cohen helped develop. “Everyone and their grandmother is doing sea ice research (now),” Cohen said.